I made my own bagels from scratch! I was so proud of myself for taking on this project, which for some reason always seemed too hard to even try. But, it actually wasn’t that difficult- it mostly required a lot of waiting for the dough to rise (I’m learning that this bread making business usually does). I had a great time making each bagel flavor unique. I topped them with: poppy seeds, sesame seeds, dried onions, cheese, pesto, fresh onions, salt, cinnamon-raisin, and Spike seasoning. I can’t say which flavor I ended up liking best, as they were all delicious! This recipe, from The Baker’s Apprentice, makes 12 bagels. I ate some fresh from the oven and sliced and froze the leftovers for easy popping into the toaster! Sesame seeds, poppy seeds, kosher salt, rehydrated dried minced garlic or onions, shredded cheese, or other creative toppings. In the bowl of a stand mixer, stir the yeast into the flour. Whisk the water into the flour mixture until it forms a smooth, sticky batter. Cover the bowl with plastic wrap and leave at room temperature until it is foamy and double in size, approximately 2 hours. Stir the yeast into the sponge. Stir in 3 cups of flour and all of the salt and malt until the dough forms a ball, adding as much of the remaining flour as needed to form a cohesive dough. Knead the dough with the dough hook for 6 minutes on medium speed, adding flour or water as needed to create a smooth and pliable dough. Line two baking sheets with parchment paper and mist with oil. Divide dough into 4 1.5 ounce pieces and form into balls and place on baking sheets. Cover the dough with a damp towel and rest for 20 minutes. Shape the dough into bagel form by poking and hole in the middle of each ball and stretching from the center out. Mist the dough with oil and cover loosely with plastic wrap. Rest for 20 minutes. Check to see if the bagels are ready to be retarded. To do this, fill a small bowl with cool water and drop a bagel into the water. If it floats within 10 minutes, it is ready for the next step, if not, let them rise for 15 minutes longer and then test again. When one of the bagels passes the float test, cover the bagels with plastic wrap and place in the refrigerator overnight. Bring a large pot of water to boil and add the baking soda. Remove the bagels from the refrigerator and gently drop into the boiling water. After 1 minute, flip with a slotted spoon or spatula and boil for 1 minute on the other side. 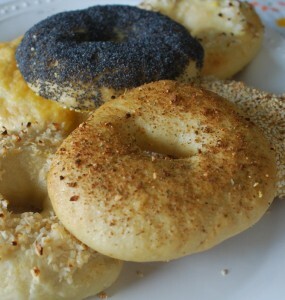 While the bagels are boiling, sprinkle the parchment paper with cornmeal. Transfer the boiled bagels back to the pans. Sprinkle toppings on the bagels. Bake for 5 minutes, then rotate pans and reduce temperature to 450 degrees. Bake for 5 more minutes or until bagels are golden brown. Remove from oven and transfer to a cooling rack for 15 minutes. This entry was posted on Monday, April 13th, 2009 at 10:00 pm	and is filed under Breads, Vegan. You can follow any responses to this entry through the RSS 2.0 feed. You can leave a response, or trackback from your own site. bout time for a new recipe! you know i still have cravings for pq’s golden bagel bagels? maybe this will do the trick as i can’t seem to find any worth eating at the shops around here.